Rotterdam is not on everyone's radar when it comes to city travel, but it is very well worth a visit for sure; a holiday to Rotterdam might be just what you need. Just like many other harbour cities within Europe - such as Gothenburg, Hamburg and Liverpool - Rotterdam is a culturally very dynamic city and home of many students, designers, architects and artists, due to its creative atmosphere. From vintage shopping sprees, an afternoon in the Museumpark, a culinary stroll in the famous Markthal, a sculpture or architecture walk, to a night out in Rotterdams vibrant bar scene - the Netherlands second largest city sums up for the perfect destination for a weekend getaway and is by far less crowded with tourist than its bigger sister Amsterdam. 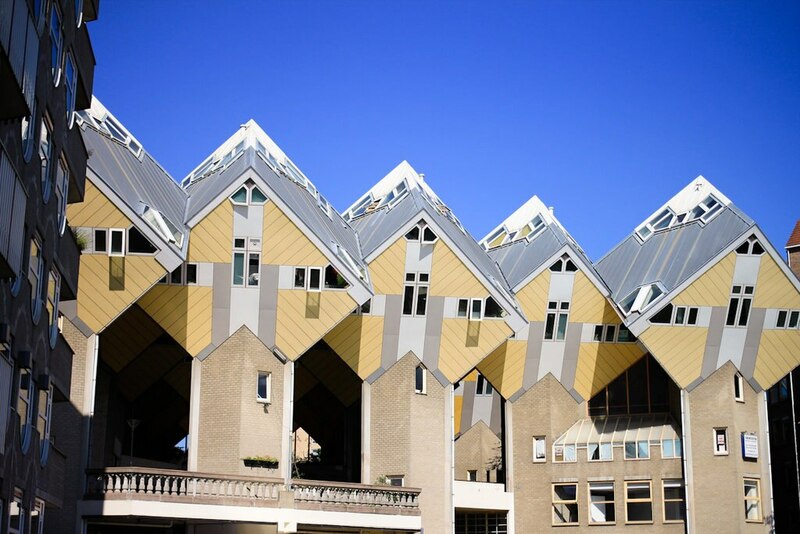 Because Rotterdam has been mostly destroyed during the second world war, it is now home of a lot of interesting architecture in many unusual shapes, colors and patterns. Visiting some of the city's famous landmarks such as the Cube Houses by Piet Bloom, the Blaak Tower, the central library or the Van Nelle factory, which is now an UNESCO world heritage sight is an absolute must. Best of all, they're all a short walk from your Rotterdam hotel. Another interesting construction is the "Luchtsingel", a yellow wooden bridge that connects the city center with the northern districts over a railway line and even through a building. The area is full of tiny urban art projects, galleries, concept stores and open air bars as well. The museum Bojmans van Beuningen impresses with a extensive permanent exhibition - with pieces by van Gogh,Kandinsky, Magritte, Dalí, Beckmann and Rembrandt - extraordinary temporary exhibitions, a very photogenic inner courtyard and a really exciting exhibition concept overall. But you don't have to go inside to see famous artists work in Rotterdam. Pieces by Henry Moore, Pablo Picasso and Paul McCarthy can simply be viewed in public areas around the city, especially in the sculpture park of Museumpark. Even though you can cover pretty much everything in Rotterdams city center by foot, their public transport system is working really well and also offers free wifi on trams. There are bike rental stations at the main station and the fastest way to get around in the harbor area is by water taxi. Rotterdam airport lies 15mins outside the city and it is only 30mins by train to Amsterdam Shiphol airport as well. 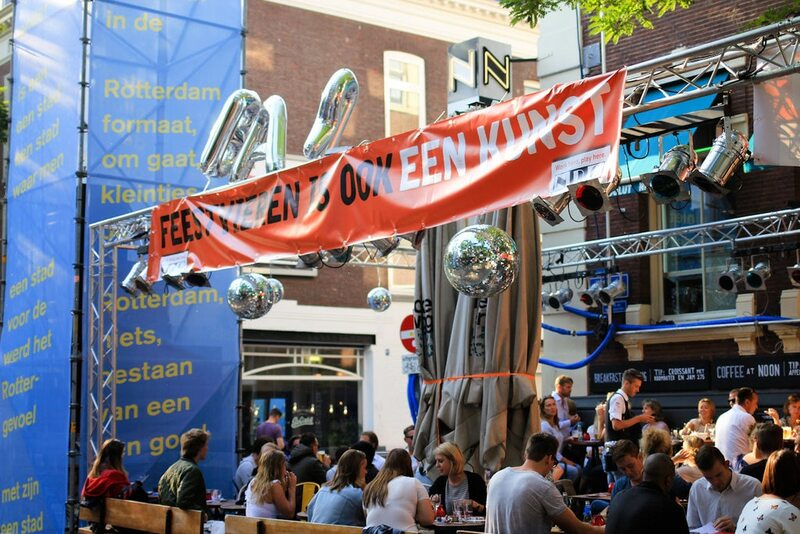 The Witte de Withstraat is the hub of Rotterdams contemporary art scene and home of many galleries, workshops, art centers, restaurants, clubs and bars. 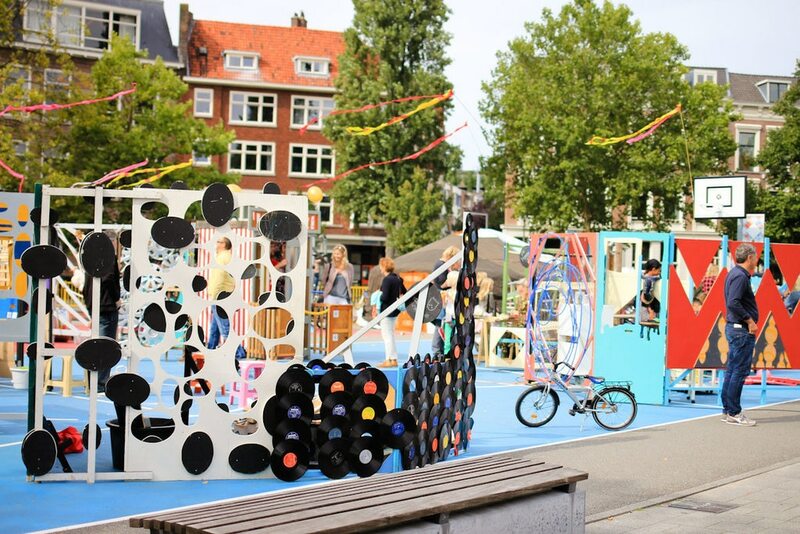 Once a year on a weekend in September, the whole neighborhood hosts a free art festival called "Kunst in het Witte de Withwartier" with many pop up installations, presentations, performances and art exhibitions in the public. The festival showcases local artists and initiatives, ranging from new talent to internationally established names and is an institution among young locals. 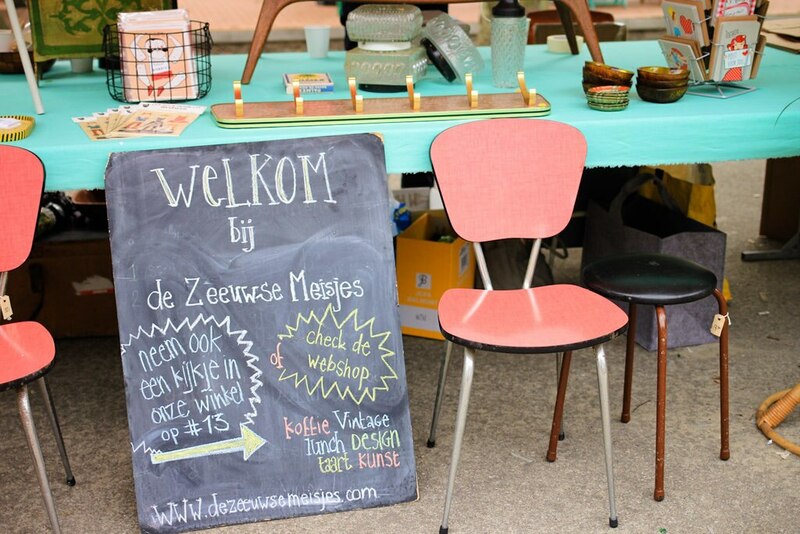 Strolling the streets of the area around Witte de Withstraat, it is like a little art treasure hunt, where there is something to be discovered behind every corner. Most of the installations live from the visitors, as they interact, dance, paint and play themselves during the weekend, just like a huge playground for grown ups. Many local personalities host free walking tours around the exhibitions during the weekend for different levels of art knowledge. Make sure to be there for the open air opening party on the main street. If you are in for a quick and cheap eat, head to one of the traditional chip stands to get fries and Bitterballen. A famous dish in the whole Netherlands called "Kapsalon" roots from Rotterdam. Consisting of fries, topped with shawarma meat and melted cheese, covered with salad was first ordered by the employees of a hair salon in Rotterdam at a local shawarma place. "Kapsalon" means hair salon in dutch. 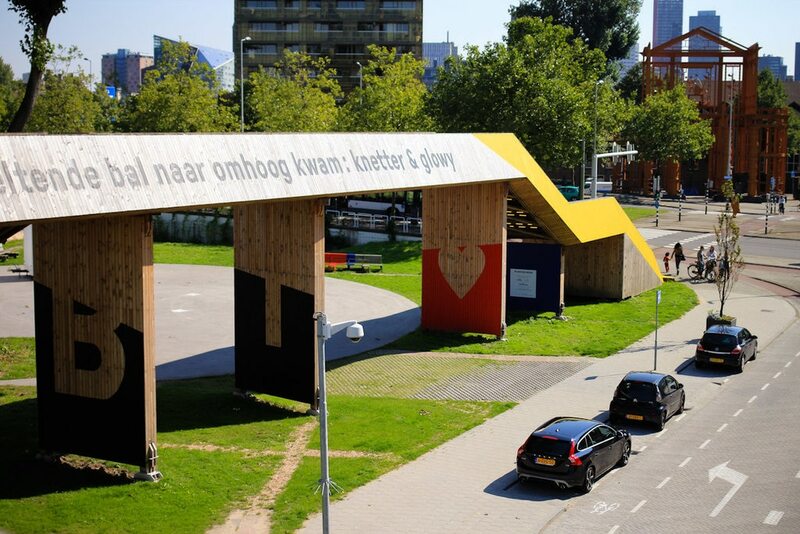 Rotterdam locals have funny names for their architectural sights around the city. As the Erasmus bridge looks like a swan, it is called "De Zwaan" in dutch, the main shopping street below street level is "Koopgoot" (Shopping Gutter) and the main station in the vernacular is called "Station Kapsalon" as it looks just like the aluminium plate the dish is served in. The five tallest buildings in the Netherlands are all located in Rotterdam (Maastoren -165m, New Orleans -158m, Montevideo - 152m, Delftse Poort -151m, De Rotterdam -150m) and it is is the only dutch city with a skyline, also called "Manhattan on the Maas"
What I loved most about Rotterdam, were without doubt the lovely people everywhere. I can't tell how many times I have been stopped on the street by a nice lady or charming older gentleman, just to tell me I'd look beautiful or to mention how wonderful the weather is today. The staff in shops and museums, baristas, tram drivers, water taxi captains - everyone was just super nice and friendly overall. This glass-clad hotel is situated opposite Rotterdam Central Station, adjacent to the Holland Casino and Plaza Shopping Centre, and near the offices of Shell, Lyondell Basell, and Unilever. Located in Centrum, this eco-friendly hotel is steps from Lijnbaan and De Koopgoot. Maritime Museum and Boijmans Van Beuningen Museum are also within 15 minutes. This Rotterdam hotel is about 0.9 km (0.5 mi) from the Beurs World Trade Center and the Maritime Museum. 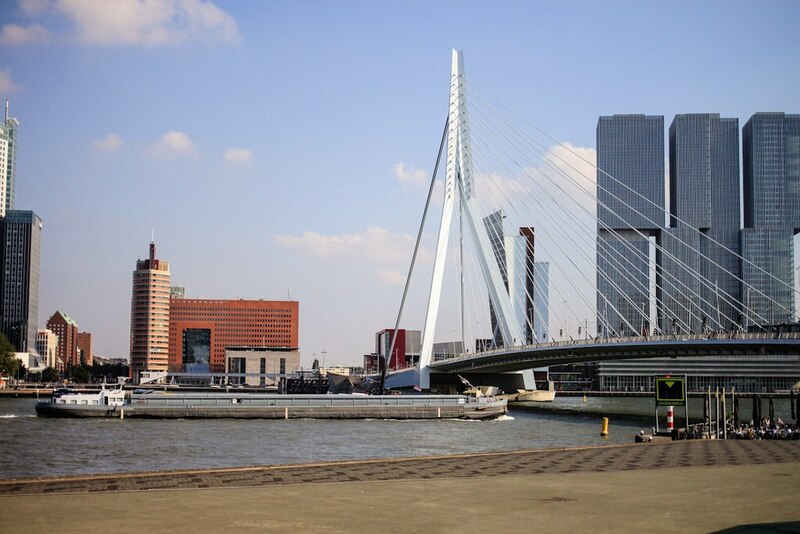 The Erasmus Bridge is 1.4 km (0.9 mi) from the hotel; Euromast is 2.5 km (1.6 mi) away. Located in Noord, this eco-friendly hotel is within 1 mi (2 km) of Rotterdam Zoo and Blijdorp Zoo. Boijmans Van Beuningen Museum and Euromast are also within 3 mi (5 km). Located in Centrum, this hotel is within a 10-minute walk of New Meuse and De Koopgoot. Maritime Museum and Boijmans Van Beuningen Museum are also within 1 mi (2 km). Located in Centrum, this eco-friendly hotel is steps from Spido and Erasmus Bridge. Maritime Museum and Boijmans Van Beuningen Museum are also within 15 minutes. Guests that book a Deluxe Room, 1 King Bed, Sauna, River View or Executive Room, 1 King Bed, River View room must present a credit card at check-in. For more details, please contact the office using the information on the reservation confirmation received after booking. Located in Centrum, this hotel is within a 10-minute walk of The New Institute and Boijmans Van Beuningen Museum. Kunsthal Rotterdam and Euromast are also within 15 minutes.